We are ideal for large groups as we have high volume accommodation and entertainment capacity. Since 2004 Hostival has been providing affordable, temporary accommodation at the biggest, wildest festivals and events around the world. Being lovers of festivals ourselves, we understand what our guests want and each Hostival site is dedicated to meeting those needs. There is no place more necessary to nurse that hangover than at the Hangover Hospital. Our guests needed a safe place to recover in order to be ready to party all over again! Contrary to the beliefs of some of our commentators...we can not be held responsible for the weather but we can how ever offer your the cheapest accommodation in a bunk raised above the ground (an advantage to other campground options that have you sleeping on the ground) in a kickass campsite with a fantastic vibe. We offer extra blankets if you ask nicely enough and have a list of recommendations for keeping warm including our fantastic cuddle puddle facilities to combat those cold nites. Our location is awesome. Thalkirchen is the green belt of Munich and only 15 mins from the Oktoberfest grounds. We have a beautiful river that runs through the park and the famous Munich wave (yes you can surf the wave and rent a board from us!!!) on our door step. The campsite is ISIS proofed and you will only hear the sounds of happiness and drunk laughter here! The campground is in an excellent position to enjoy the Oktoberfest. The local underground station (U-Bahn Thalkirchen) is reached either by the regular local bus or 10 minute stroll. The station is just 3 or 4 stops from the Oktoberfest. The campground is in a nice leafy part of Munich right on the river with nice parks and local bars, beer gardens and restaurants within easy walk. Bunks in tents where you have access to electricity and lighting in all dorms. No lockers but a secure reception area. Each dorm has plug sockets to charge your stuff. 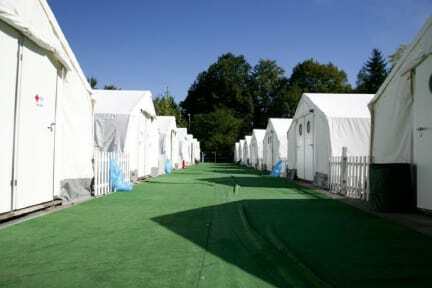 - Temporary overflow festival accommodation; ie: it's only there for a few weeks so it is basic - a bed, shower and toilet. What else would you need? Really fun place, great staff, friendly camp dog, and good value to be near Oktoberfest but not right in the middle of the action 24/7. Best hostel for Oktoberfest!! The vibes were unreal the staff was amazing the location is great! I have nothing bad to say at all! The American girl at the checkin was great! Cheap and decent location for going to Oktoberfest. No lockers for you stuff, though, so keep that in mind. This is a place where you can sleep during Oktoberfest. Nothing fancy, but it’s adequate and affordable. Really bad, I imagined that was bad but this was outside my expectations. The worst is that is reallly far from Oktoberfest and is super cold. Basically a large tent in a camp ground. People outside we’re partying very late into the morning. Conditions were unpleasant to a point we left and got a hotel. Would never go again and would strongly discourage anyone else from staying. Throw up on the sheets. Neighbors blaring music until 4 am. We were expecting something much different... don’t get your hopes. TENT NOT A BUILDING. A 40 minute commute on public transportation from Oktoberfest. They don’t wash the bedding they give you to sleep on and the door to my tent didn’t even close. Spare yourself and splurge to stay elsewhere.